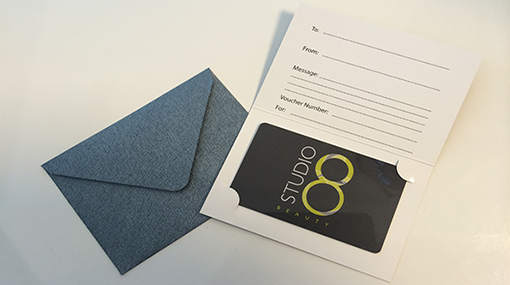 Give the gift of pampering and relaxation with Studio 8 Gift Vouchers ! 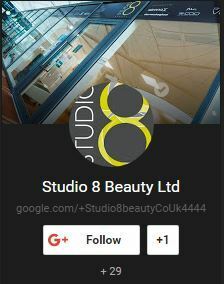 Studio 8 gift vouchers are available for purchase by visiting the salon or online and are available for chosen treatments or values from £20. They come in a unisex Studio 8 branded design, complete with an attractive card carrier (including space to write your own message) and a pearlescent envelope. They make great gifts as they can be used in part or full payment in the salon for products or services. All gift vouchers are electronically activated via a unique barcode, valid for 12 months and can be used across several visits (where applicable). Our gift vouchers can also be topped up, so if you have a loved one that you like to treat regularly you can top up the card time and time again. Why not purchase a course of 6 back massages or a monthly manicure for a year. Gift vouchers purchased online are posted to you or the recipient the next working day by Royal Mail 1st Class Recorded delivery at a charge of £1.77. Our gift vouchers can be purchased in different amounts. Just selected the value of the card you wish to purchase from the drop down menu. Vouchers can be purchased for the following values – £20, £30, £50. £75, £100. £150 and £200. If you require a Gift Voucher for a different amount, please telephone us on 023 9238 0692. All gift cards are electronically activated via a unique barcode, valid for 12 months and can be used across several visits (where applicable). 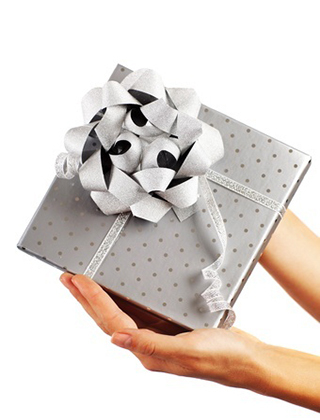 Gift Voucher Terms & Conditions: Vouchers cannot be exchanged or refunded for cash. Lost or stolen vouchers cannot be replaced. Card value is redeemable, in part or full, against services. The value of the voucher will expire if not used within 12 months from date of purchase. 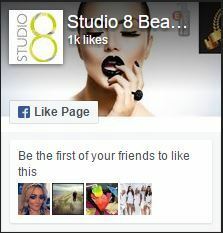 Studio 8 reserve the right to change the terms and conditions subject to reasonable notification. 1st Class Recorded delivery of our gift vocuhers is charged at £1.77 and added at checkout.